From ride-hailing apps to shopping services, the sharing and on-demand economy has grown in the U.S., yet a relatively small minority of the public is incorporating shared and on-demand services deeply into their day-to-day lives. 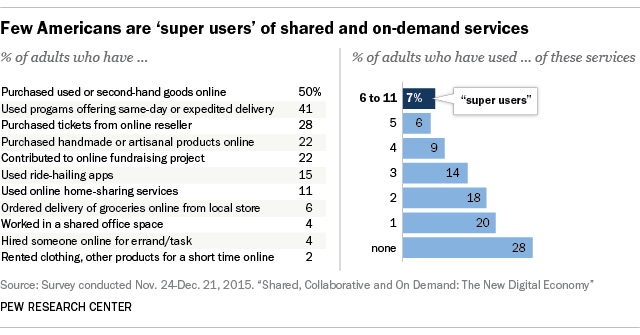 Still, some Americans are “super users”: 7% have used six or more services (out of a total of 11), according to a Pew Research Center study. Some of the services measured in our survey – though by no means all – are relatively new, and their users exhibit common characteristics of early adopters: Nearly six-in-ten are college graduates, and roughly half have an annual household income of $75,000 or more (with one-in-five earning more than $150,000 annually). 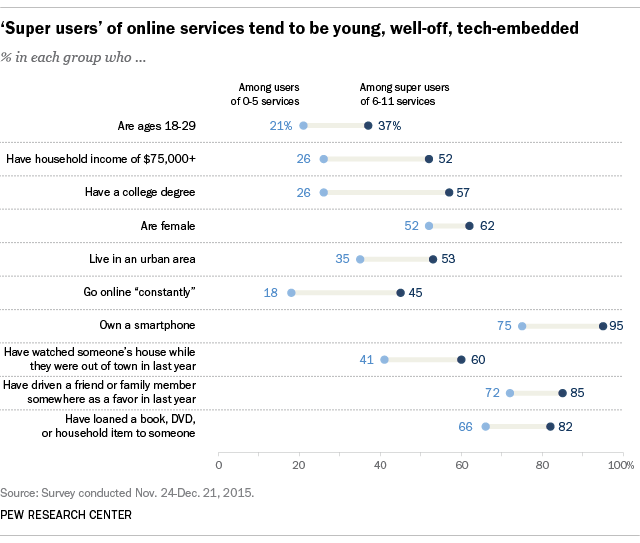 Just over one-third of these intensive users are ages 18 to 29, and the median age of this group is just 34. There are some respects in which these users depart from the early-adopter stereotype, however. Most notably, they run counter to the common (if highly contested) assumption that men are always the first to use new technologies, since our survey found that 62% of these super users are female. That said, even among women this level of engagement is relatively rare: Just 8% of all women and 5% of men use six or more of these services. These intensive users also are no less diverse than other Americans: 64% are white, nearly identical to the share of whites among those who use five or fewer of these services (66%). Even as they use technology to connect with gig workers who can help them with their day-to-day needs and tasks, these super users engage in a fair amount of sharing on their own. In the year before the survey was conducted, 85% have driven a friend or family member somewhere as a favor; 82% have loaned a book, DVD or household item to someone they know; 60% have helped watch someone’s house while that person was out of town; and 44% have shared their login to a paid website or streaming service. For this group of users, the technological advances of the shared and on-demand economy seem to supplement – rather than replace – sharing behaviors in the traditional, informal sense of the word.